FREDRICKSBURG, Va. – Construction to build a new bridge over the Rappahannock River to carry three new southbound lanes of Interstate 95 is getting underay in November as part of the $132 million I-95 Southbound Rappahannock River Crossing project. 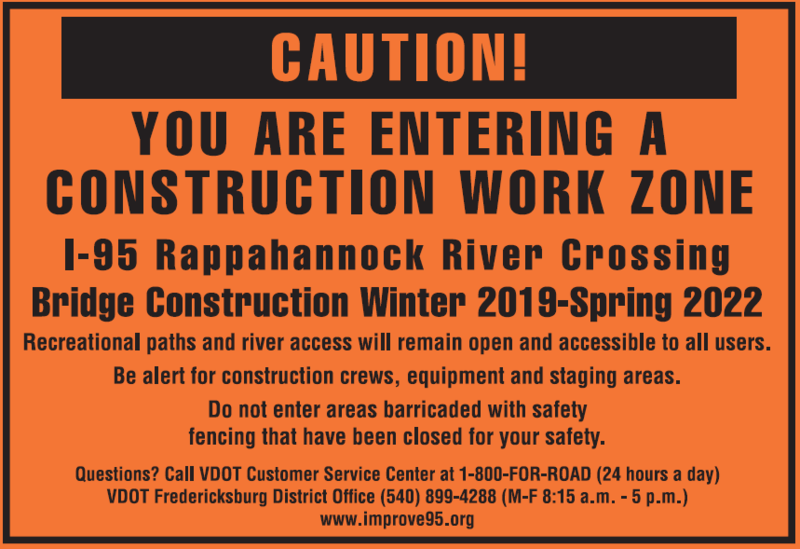 VDOT will maintain access to walking, hiking and bicyclist paths near the Rappahannock River throughout the four-year project. Friends of the Rappahannock has shared concerns with VDOT regarding adequate communication and signs for all recreational users. Residents should be alert for increased construction traffic and activity on Wicklow Drive and Quarry Road in the City of Fredericksburg. There will be construction crews, equipment and periods of one-way, alternating traffic on Quarry road. Signs will be posted near the entrance to the Quarry Road from Wicklow Drive an Gordon W. Shelton Boulevard to notify pedestrians and bicyclists that they are entering a work zone. Safety fencing will be installed surrounding the construction work zones near the I-95 bridges to separate recreational users from construction crews, equipment and material. FOR intends to work with VDOT to help keep all our members informed of any new developments that impact recreational use.